In large bowl, beat granulated sugar, shortening and softened butter with electric mixer on medium speed, scraping bowl often, until creamy. On low speed, beat in vanilla and egg. Stir in flour blend, baking powder and salt until well mixed. Divide dough in half; shape each half into disk. Wrap in plastic wrap; refrigerate about 1 hour or until firm. Heat oven to 375°F. On work surface lightly sprinkled with flour blend, roll each half of dough to 1/4-inch thickness. Cut with 2 1/2-inch cookie cutter. Place 1 inch apart on ungreased cookie sheets. Bake 8 to 12 minutes or until edges are lightly browned. Let stand 2 minutes on cookie sheet; remove to cooling rack. Cool completely, about 15 minutes. Stir together Glaze ingredients. Spread on cookies. Sprinkle with additional granulated sugar, if desired. When these cookies are all dressed up, they take the stage on the cookie plate. But they are so good just cut into circles, left undecorated and enjoyed as an after-school snack. This recipe was created for our new Betty Crocker® Gluten-Free Rice Flour Blend available in grocery stores in late July. Until then, feel free to try this recipe using any gluten-free all-purpose rice flour blend found in larger supermarkets and co-ops. 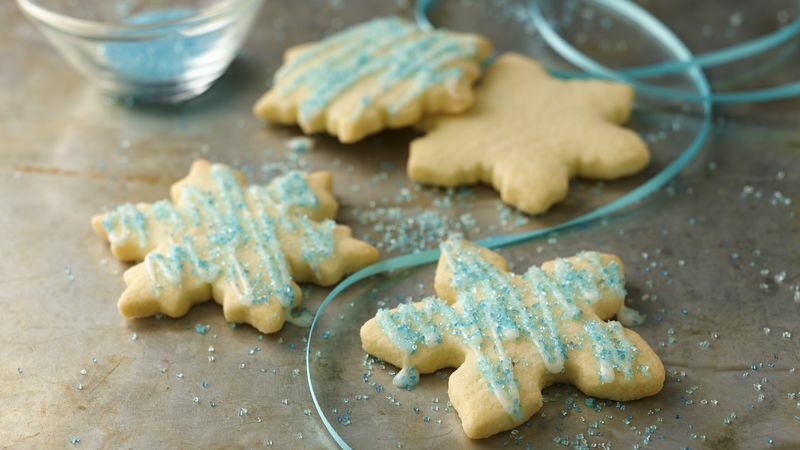 More About this Recipe : Simple and sweet, sugar cookies are practically perfect in every way. So wouldn’t it be wonderful if you could make a version even more people could enjoy? This gluten-free sugar cookie recipe is an excellent option that tastes great and is perfect for gluten-free friends and family members. Betty’s All-Purpose Gluten Free Rice Flour Blend takes the guesswork out of sometimes-complicated gluten-free baking. The easy glaze takes them up a notch from plain sugar cookies and prepares them for your favorite sprinkles! Just be sure to double check the labels to ensure all ingredients are gluten free and serve gluten-free items on a separate plate for guests who are allergic. Looking for tips and tricks on how to make sugar cookies even better We’ve got all the info you need.